Even if you already understand what is required and how to start coding your solution. The best approach will be create one or more diagrams of how will your solution be interact with its environment. A sequence diagram will help you to know how your classes and participants will interact and what could be optional. 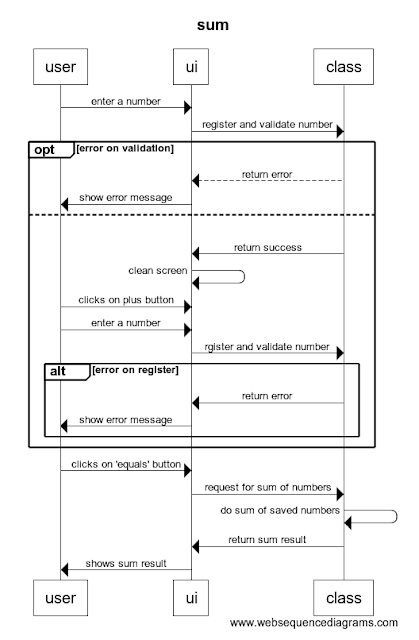 For example it is easy to do a simple code to add two numbers, but what about possible errors and how interaction will work, do have a better idea and to have clear the responsibilities a good idea could be a simple sequence diagram. * This diagram could show us a better idea of how the app will work and maybe can help us on understand better how we should do the division of the work or which kind of pattern could we use. Now what if we create a class diagram to separate the responsibilities and organice how code will be done. This diagram could help us to define classes with its attributes and methods that could make easier to know the code we will made. When I started to read it I thought it was just about AngularJS api but after the first chapter I noticed that the book has more that simple AngularJS examples. One of the things I love is the Tips when the author explain why is better to use one or other tag, branch or code, that is the best way to learn why one or other code do the same but one is better that others. This book comes with a real important chapter about tools to take the best advantage of all the AngularJS framework through many packages as grunt, yeoman and karma. And real examples, from a simple web app to a more complex CMS, but one of the best is how to setup a Scalable Architecture for real. If you have any commets about this, please let me know!